At the confluence of Gurupur and Netrabati rivers on the coast of Arabian sea port city Mangalore is located.From this coastal belt spices used to be exported to foreign markets of Arab and persia in the 14th & 15th AD.Since the 6th century port Mangalore has a name in history for exporting black-pepper.75% of the indian coffee, cashewnut and cocoa is exported from mangalore. It stands 9th position in the rating of import-export bussiness. Along with the moyajjin of the mosque,bells from the church and temples make the morning a heaven.While you visit Mangalore donot forget to enjoy Yakshagana dance or Kambla buffalo race.Mangaladevi temple of 10th century is the main attraction of the city.You may visit the new port Panambur , 10km from the city.The adjoining sea beach Suratkal is beautiful. 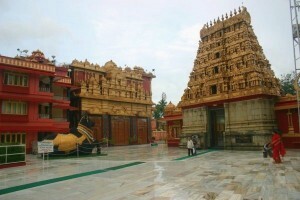 This entry was posted in Karnataka, Mangalore and tagged about mangalore, holiday mangalore, mangalore side seeing, mangalore temple, mangalore tour, mangalore website, travel guide mangalore. Bookmark the permalink.